As winter approaches (it was in the high 30s this morning when I woke), most of us have put away our backpacking gear. My wife and I have a couple more longish day hikes planned in the weeks ahead, but there will be no more overnight trips until 2019. These short days and cold nights are a perfect time to catch up some on the history of the trail we all love so well. 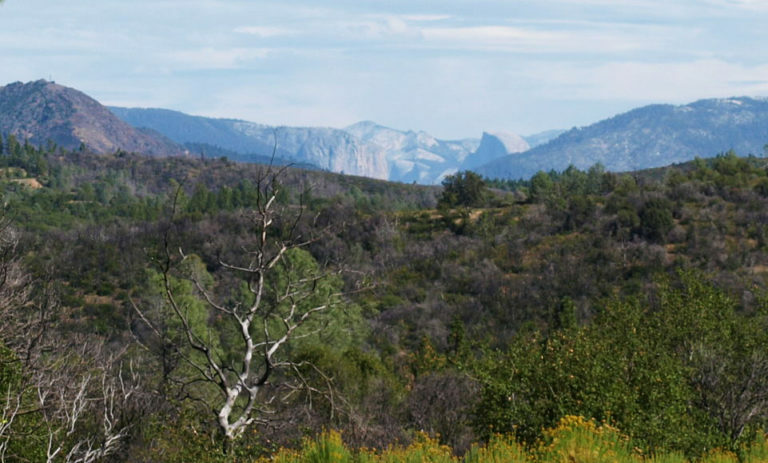 Today I begin a multipart post revealing a little background behind the names you will encounter as you walk from Yosemite National Park to the top of Mount Whitney. We’ll begin at the southern trailhead. Happy Isles. After the Yosemite Grant was signed in 1864, by President Abraham Lincoln, a series of “Yosemite Guardians” were appointed to care for the valley. The first was Galen Clark (see Clark Point, below). 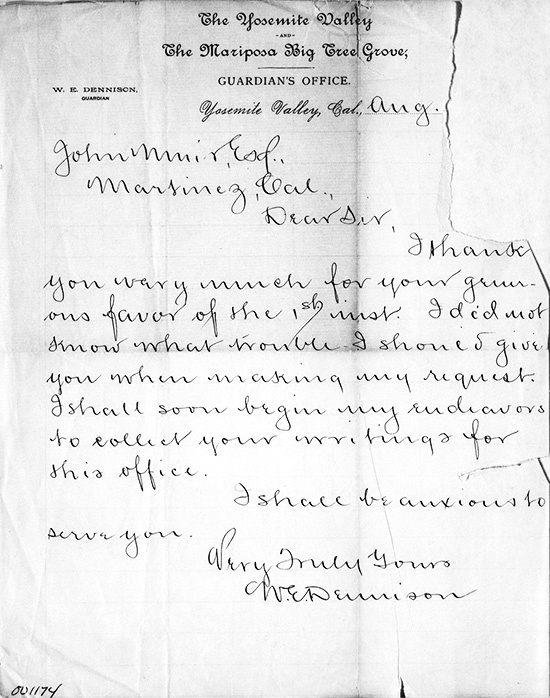 The third, W. E. Dennison, in a letter written in October of 1885, wrote, “I have named them the Happy Isles, for no one can visit them without for the while forgetting the grinding strife of his world and being happy.” The image, above, is of a thank you letter written by Dennison to John Muir while he was guardian. Mist Trail. 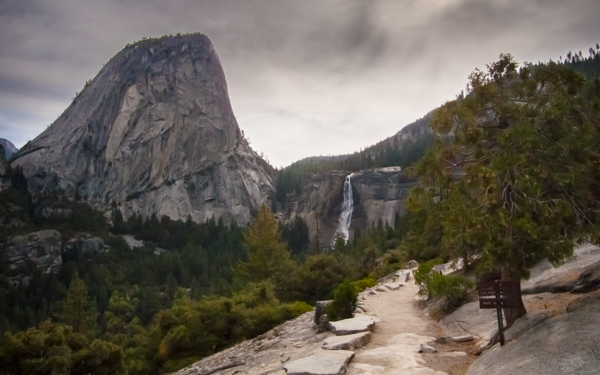 The Mist Trail is an alternative route to the top of Nevada Falls. If you are hiking the JMT you will pass the trail intersection where the Mist Trail begins, but you will not actually walk it. The trail gets its name from the all-enveloping cloud of moisture, created when the Merced River falls on the rocks adjacent to the trail. Much of the trail was built, as it appears today, by the Works Progress Administration (WPA) in the 1930s. The name first appeared on a map in 1958. Vernal Fall. The Native American name was Yan-o-pah, translated roughly into a small cloud (see Mist Trail, above). Lafayette Bunnell, a member of the Mariposa Battalion, named the waterfall “vernal” in 1851 because it reminded him of an “April shower.” A member of the Mariposa Battalion, Bunnell is credited with leading the first expedition of western (non-Native American) explorers into Yosemite Valley. The photo, above, is estimated to have been taken near the spot where many of the iconic valley landmarks would have first revealed themselves. Clark Point. The most spectacular view from the the first few miles of the John Muir Trail comes from Clark Point. Named for the first Yosemite Guardian, Galen Clark, the views of Liberty Cap, Nevada Fall, and the back side of Half Dome are awe inspiring. Clark is credited as the first westerner to discover the Mariposa Grove of Giant Sequoias. He stumbled into the grove after moving to the mountains at the advice of his physician. The fresh, mountain air was to add a little time to the six months he had to live, after being diagnosed with tuberculosis at age 39. It must of worked, since he died on March 24, 1910 – four days prior to his ninety-sixth birthday. I hope you have enjoyed this; more next week! Thanks for the kind words, Kieran. Lots of questions here; let me take a shot at them. PLB: I carried one of these on my first thru-hike, but have not since. I have not carried one on my other Sierra Nevada hikes. I do not believe that they are necessary (from a safety perspective) on the John Muir Trail, simply because it is so well trafficked. They are great to have so your friends and family can follow along from home though. I do talk about them a little on page 54. I bring some small containers of toiletries (including some soap…I like clean hands); just make sure they all make it into the bear canister every night! I am not a sunscreen guy on the trail; I find that it is too sticky and that is seems to attract dust. Instead, I wear pants, a long-sleeved shirt, a bandana (I really like this one, especially in hot weather when I get it wet before wrapping it around my neck), and a hat. That is more effective, saves weight, and doesn’t smell…well, at least for the first few days. I bring a little duct tape wrapped around each of my trekking poles as well as a lighter (which, after years, my JetBoil never needs to light), and toilet paper. I have not brought electrolyte powder, but I think that idea has a lot of merit. It may be on my list next time. My only cooking/eating utensil is my Light-My-Fire spork. Thanks again for the questions and the comment! Kieran – I tend to agree with Ray on a lot of the items he mentions, but hopefully this might help you. I do use an InReach, but only because it gives my family peace of mind and they like to follow-along with my hike. I use a map downloaded to my phone because it is multi-purpose, (serves as my camera as well) and the trail is fairly easy to follow, with the possible exception of the Devil’s Postpile area (although I download the map as there is very, very little reception on the trail). I also use the phone to take notes, (I do bring a battery bank) so I don’t bring a notebook. I do bring a hygiene kit, but it is very minimal and lightweight. Camp soap (no deodorant – it’s useless) some toothpaste tablets, mini toothbrush, a teeny tiny amount of sunscreen, (only wear it on face, and only in a couple of sections). I find sunscreen to be bug-attracting, and uncomfortable. I keep arms and legs covered, and wear a hat. I only use the sunscreen during those rare times when my face might be exposed, so the total I bring is approximately an ounce. I bring very little toilet paper – use mostly the bidet method. My stove has an igniter, but I do bring a mini-bic lighter, as an emergency backup and for those rare areas where fires are allowed. Duct tape wrapped around the trekking poles. Approximately 6 inches of the mini duct tape (I believe it is SOL brand) on each pole. I do keep some tenacious tape in my repair kit. I do use some electrolyte powder, but sparingly. Only make 8 ounces of electrolyte drink, and only do that on the hard pass climbs. More than anything – I have learned that I pack lighter every year. I’m getting older, and a lot of weight is prohibitive for me, and the lighter weight sure makes a difference in high altitudes. I learned through multiple multi-day backpacking trips, what I really need, and what is unnecessary. Thanks very much for your comments. It sounds like you have a lot of experience on the JMT. I wonder if you could help me with a few other queries? 1) It seems as if it’s best to have a departure date after Labour Day – September 2, 2019 – to maximise chances. I was thinking of putting the permit application say starting August 25 which would take me through until about the second week of September for the ballot. I’m planning on 25 days so even if I got a permit starting say September 7 it would still get me to Mount Whitney by the first week of October. What do you think of that as a plan? How difficult is it to get September departure permits do you know? 2) I presume they have no allocation for senior applicants or allocations for foreign hikers on the JMT. Is that correct? 3) One item I didn’t put on my list that I sent Ray is a Leatherman tool. I always take one but neither he nor you mention it. Is there a reason? 4) I’m having real difficulty finding out the closing dates of the resupply points at places like Reds Meadow et cetera. Some of the blogs suggest that many of the resupply stores start closing very soon after Labour Day. That would make it a bit problematic for a departure say at the end of the first week of September. Do you have any information? 5) Interesting how different countries treat sunscreen. Both you and Ray don’t put it high on your list of priorities. I found in long-distance hikes in Australia and certainly mountain climbing in New Zealand and heli-skiing in Canada that even when wearing a hat and protective gear, my earlobes, underside of jaw and the septum in my nose, gets very badly sunburnt through upward radiated sunlight. This can be very painful and debilitating if it’s left to its own devices. A hat helps for most sun protection but not in these areas because the radiation is coming from below. 6) in many of the blogs and in Ray’s book there is an emphasis on water purification. However when I look at the topographic maps it seems that as you’re walking across a lot of ridges that you are actually near the headwaters of a lot of creeks and streams. In this situation in Australia in backcountry hiking we would never purify the water. We tend to purify water here in reasonably heavily populated areas at the bottom of valleys e.g. in the Blue Mountains west of Sydney. Do you think that there is a bit of overkill with water purification on the JMT. I would have thought that as many of the lakes are presumably snowmelt or springs that they would be very clean. Kathy, please feel free to jump in. I thought I’d offer a few quick thoughts. 1. Getting a permit in September is still difficult, but you are right to assume it is a little easier than August. I wouldn’t worry too much about snow during the first week in October, although it is possible. You will have some cold nights, though. 2. Nope…everyone is treated the same. 3. I have carried a multitool in the past, but never really used it. Here is something I do bring: a second small washer to get into my Bearikade in case I lose the first one. 4. Reach out to Red’s, VVR and MTR and they will happily give you some historical data. With a September 7 start date you should be fine, although the transportation from Red’s to Mammoth might be cut back by the time you get there. 5. Like a belt and suspenders, sunscreen and protective clothing can’t hurt (except for the weight). Your call! 6. There are people who hike in the Sierra without purifying water. I will occasionally do that if I am drinking from a spring, or high – near the source of a stream. On one JMT hike my SteriPen stopped working and I went a couple of weeks without purifying and without a problem. Still, I always recommended purifying; it only takes one time to ruin a trip. 7. The app I use on my iPhone (Gaia GPS) allows me to download maps PRIOR to departing. I then keep my phone in airplane mode (the GPS still works) to conserve power. You are right, though, a paper map, along with the skills to properly read it, will never let you down. The iPhone is also a camera and an e-reader, and there is coverage every once in a great while. I sure like being able to call my wife! Kieran Kelly – My apologies for replying so late. I didn’t receive a notification on this post for some reason. I agree with Ray on much of this. 1. Getting a permit in September is still difficult as Ray points out, and permits seem to be an issue every year. My personal preference these days, is to actually go Northbound, rather than Southbound, starting at Horseshoe Meadows, (Cottonwood Pass) as this is an easier permit to obtain, puts the sun at my back most of the way, and eliminates the worry of being on Whitney in October, (I turned back from a Whitney climb one year after a major snowstorm occurred the first week of October, the year climbers had to be rescued via helicopter). I do however, spend extra days acclimatizing because you get the high elevations early in the trip. This is personal preference, but is an option. 2. Ray is right. No distinction here. If you are coming from out of country, and planning is crucial, then the Northbound permit is (in my humble opinion) is much easier, and less of a hassle than the typical lottery process (like starting at the Main Whitney Trail). It does add a few days to the trip, and you will want to do extensive research, but I find the permit process much easier. 3. I do use a multi-tool, but only ever tend to use the little mini scissors and sometimes the knife to cut extra line. Other than weight, can’t hurt to bring it. I use a bearikade like Ray, (although I use quarters to open mine) and bring 3 quarters just in case, (and I have lost more than one…lol). 4. Agree with Ray here. You need to check directly with them. Opening and closing dates can vary by year. 5. I do bring a bit of sunscreen….just not very much, and not for arms and legs. As stated previously, I go Northbound now, so need a lot less of it these days. 6. I personally always purify water. Here is my reason for that – in addition to seeing quite a few animals “doing their business” while drinking from a stream, I have seen way too many humans, not using proper precautions near water. I’ve seen them going to the bathroom mere feet from a water source, and even witnessed someone doing their dishes (with tons of soap) directly in Chicken Spring Lake. Maybe I am over cautious, but this is one thing that I do not compromise on. You will no doubt, need to tank up at quite a few lakes where people swim with sunscreen on. Not trying to be alarmist, but I also knew someone who got giardia in the Sierra, and the small inconvenience of purifying water, is well worth the peace of mind for me. 7. I use my phone exactly like Ray, including Gaia app. I also keep mine in Airplane mode, and use the phone as my camera. I’ve spent more than one day sitting in my tent during heavy downpours, where the Kindle app really helped pass the time as well. In addition, I have had to exit early or had plans change on multiple trips, and being able to make calls and change travel plans was crucial. In addition, I use the Garmin InReach, where I have 2-way texting, to let family know how I am doing, and to get weather reports. Yes, this requires that I carry a battery pack, but the battery pack and phone together, way less than my DSLR camera, which I leave at home, in favor of the phone. For me personally, the phone is a valuable multti-function tool that I wouldn’t leave behind. I am acutely aware that my family worries about me while I am hiking, so I check-in every time I have signal. We carry an inreach. My husband is 80 and I am 62. He has had a few medical issues in the past that required emergency care. We hike with llamas so we typically camp out of sight of the trail. I would feel very much alone if one of us had a medical issue and no one was going to notice us, in trouble and out of sight of the trail. I am haunted by the woman, hiking solo, who died alone, half a mile from the trail, after stepping off the AT to take a bathroom break. She was unable to find the trail again and died of starvation some 17 days later. If she had a GO device or Inreach she would have been found by the multitude of people searching for her. Thanks for the comment, Marion! Ray: This is quite a task you have set for yourself. I have been delving into a bit of history as well, as part of my JMR project, and looking forward to the future installments in this series. Thanks, Peter. I’m looking forward to working my way south! I agree with Kathy, for “I have learned that I pack lighter every year.” Toss this, substitute that, make this other do double duty. I’m probably 35 pounds, skin out, and it’s less every time. As to the PLB, I understand that there’re safety in numbers. But even the strongest hiker, sprinting to a trailhead to call for help, can’t beat the speed of light summons of my ACR. Ask Amy Racina. Thanks for the comment, Jeffery. Upon re-reading my comments regarding PLBs I think I may have done a poor job of describing where I stand on these devices. As I said in the comment, I have used them in the past. My personal cost-benefit analysis, factoring in my experience on the JMT, the cost of renting, the weight of the device and batteries, and other factors, led me to the decision to not use one in subsequent JMT hikes. That does not mean that I do not support their use. In fact, now that I am hiking in less travelled areas in the Sierra Nevada I am intending to buy one before the start of the next hiking season. Once I have one, I’ll probably carry it on every hike – even day hikes. As it is with most things, my bottom-line suggestion is to do your own analysis and hike your own hike. One last comment, for those not familiar with Amy Racina, check out this. Thanks for your comments. Lot of JMT experience there. It’s interesting how different cultures/experience determine what we think are the critical elements in wilderness trekking. With all the people I’ve guided the most critical difficulties I’ve had and the most numerous are with dehydration and heat exhaustion. That was the first thing I looked for on the J M T. I note that towards the end of the walk there are some very stiff pitches, not long admittedly but doing them around midday in August would give some people grief particularly those not rehydrating properly, those that are overweight or those not used to carrying a pack. In that situation water and electrolyte consumption becomes critical. Circumstances and experience have a big bearing. A few years ago when I was guiding on the Kokoda Track in New Guinea a research field hospital had been set up in the jungle at the top of Imita Ridge one of the very steep climbs on the track. They were trying to ascertain why so many people died at Kokoda from hyponatraemia. Aware of this problem I made everyone in my group take two 1 Litre water containers – one filled with electrolyte and one filled with freshwater and drink alternatively from each container. When we got to the top of the ridge about 3 PM we were all subject to blood tests and we all came through fine. In the group in front of us was somebody already on a drip in the tent hospital. He was close to death. It was subsequently learnt that he had consumed 13 L of water between 7 o’clock in the morning and 3 o’clock in the afternoon and no electrolyte. He was on a massive sodium drip to try and save his life. I think one of the things that people don’t realise is the critical relationship between radiated heat, humidity, water consumption and electrolytes. Throw severe sunburn into that mix and you end up close to catastrophe. It’s not just in Australia or New Guinea we have these problems. I guided 14 Australians two years ago around some of the major national parks in southern Utah and Northern Arizona. One location Fiery Furnace, gave a classic example of the relationship between radiated heat, heat exhaustion and sunburn. It was the first week in September and while I got everyone drinking and wearing proper headgear. I still had several cases of very severe sunburn and one of heat fatigue at the end of a relatively short walk of about three hours. Some environments which are seemingly benign, such as Fiery Furnace or the northern rim of the Bright Angel trail in late afternoon, in August can be very unforgiving. Thanks for the info, Kiernan. Great stuff!